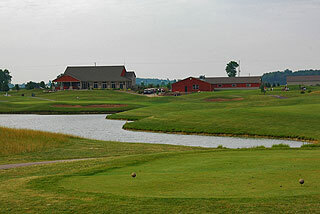 Copper Ridge Golf Club in Davison adds another niche to the list of quality courses opened in Southeastern Michigan in the past year. Located on Atherton Road, just east of M-15 (about 18 miles north of I-75, Clarkston exit) Copper Ridge features a relatively wide-open design amidst a gently rolling terrain. 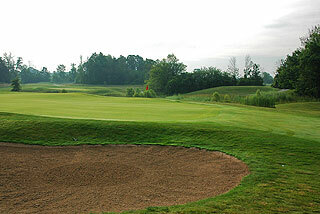 The defining characteristic of Copper Ridge has to be their incredibly challenging, undulating greens. 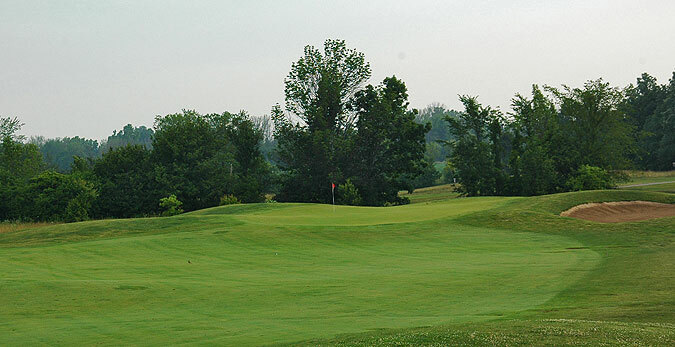 With generally expansive landing areas off the tees and few water hazards, you will have a reasonable chance of reaching many greens in regulation. The whites play at just over 5600 yards. If you play from the blues (6360 yards), you will have 6 par fours of 390 yards or more. With the exception of #11 (189 to 251 yards), the par threes are of reasonable length, as are the 4 par fives. The level of difficulty is spread out evenly over the course - with holes 1 through 9 featuring the odd handicapped holes, and 10 through 18 providing the even. 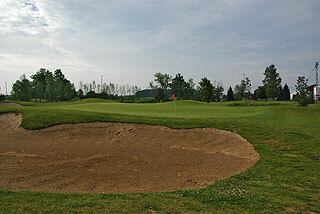 The opening holes (a relatively short par 4 and par 3) give you an opportunity for a good start. 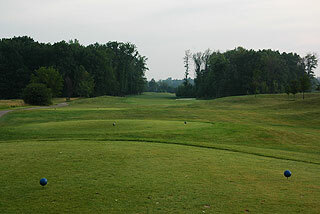 The third and fourth holes are the tightest driving holes on the course, demanding long, accurate tee shots to the left side of the fairway. 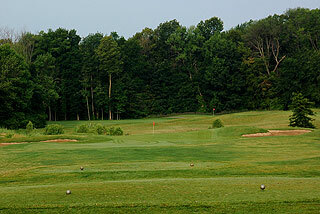 After an easy and picturesque par three, your driving ability will be tested with the 3 relatively long par fours. The ninth is the most challenging (and the #1 handicapped hole), with an approach over water to a green fronted by an intimidating bunker. This is a beautiful hole, but a tough way to finish the front. 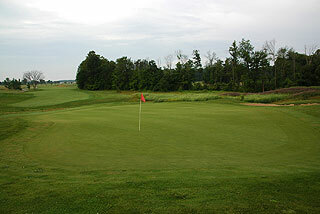 The preceding par 5 is a great birdie opportunity if you reach the correct portion of the green. Your ability to score all day will depend on one factor. Approach the green from the correct angle, and be sure to go for the flag. The undulations are quite extreme and will result in many 3 putts if your approach is wide of the hole. Copper Ridge has some devilish pin placement positions, and we seemed to encounter many of them during our round. The greens were in great shape for a first year course - quick and true - but extremely difficult. There were relatively flat areas near each hole. The key is to get it close enough for a 2 putt. *There was no pin placement system in place, which made scoring well even more difficult. There will be a system in place before the 2002 season begins. Other than the long par three 11th, the first 6 holes on the back nine are quite score-able on paper. Number ten is a dogleg left with some significant and strategically placed bunkers, and twelve is a risk/reward dogleg right par 5, around a considerable pond. The short par 4 thirteenth looks easy, until you see the green. 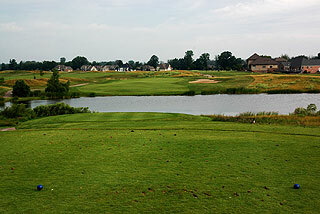 The next 2 holes are the easiest combo of the layout, a medium length par 3 and a short, uphill par four. Hopefully you will have scored par (or better) on these middle holes, as the toughest sequence follows. Numbers 16 and 17 are the two longest par 4's on the course (466 and 463 from the tips). The closing hole is another beauty, that somewhat mimics the closing hole on the front. There is a bit of room for error on your tee shot, though thick, heavy grasses will engulf your ball if you stray too far. Your second shot will approach the green, which is guarded by water in front and bunkers all around. This is another short, risk/reward par five that can make of break your round. Just remember that at Copper Ridge it is not often good enough to merely reach the green. You have to run it up to the correct portion, unless you can read greens very well and have excellent lag putting ability. G.A.M. markers have recently been placed in the tee boxes, and 150 yard stakes are in place on each fairway along with yardage markers from 100 to 250 yards out. When a pin placement system is incorporated, it will make quite a difference in helping to plan shots and to navigate the greens - which are challenging, but are also fun. Course knowledge will help immensely. With Copper Ridge's reasonable rate structure, you will certainly have the opportunity to play this course time and again. 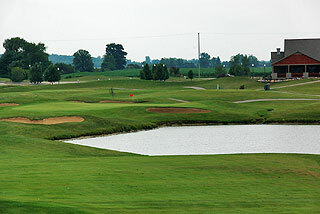 A grass practice range and putting green are also on property.